If you have a friend who is happy with their career, it’s always worth asking yourself if you also might enjoy a similar role. Not only do you have direct, first-person evidence that that specific career is enjoyable, your friend could also be a useful source of guidance, support, and insight into what the role entails if you do decide to give it a try. “One of the first things you should ask yourself is what is your dream career. Believe it or not, many young children have a career in mind, going back to elementary and middle school. It is not unusual for some children to make their career dream a reality, by getting a degree in that field. Regardless, if your dream career is a teacher or lawyer, you can make it come true. And, you do not need millions of dollars to make this happen.” – What Is Your Dream Career? 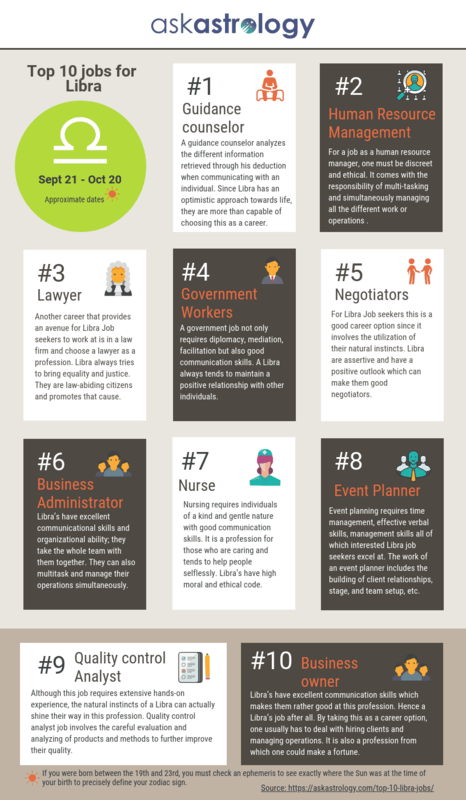 If you’re a fan of astrology, then it might interest you to know that it is thought that certain occupations suit particular star signs – as you can see on the Libra-focused infographic below. As a result, it’s worth looking into the suggestions for your specific star sign to see if you can find anything that you feel might be suitable for you.